This spicy, delicious dish is made for eating with your fingers. 1. For the piri-piri oil, place all the ingredients except the oil into a blender and blitz until smooth, slowly adding the oil after 20 seconds. Place in a container and let sit for a minimum of 1 hour, but preferably overnight. 2. For the chicken, use a sharp knife or kitchen shears to remove the backbone. Then flatten it out by placing it skin side up on a cutting board and applying firm pressure to the breastbone. Rub with sea salt in both the cavity and skin before transferring it to a wire rack set over a foil-lined baking tray. 3. In a bowl, combine the 30ml piri-piri oil, smoked paprika, garlic, thyme and lemon juice and mix well to combine. Rub mixture all over the chicken and allow chicken to marinate for 1 hour or overnight. 4. Preheat oven to 240˚C (220˚C fan-forced). Roast the chicken, basting occasionally with extra piri-piri oil until cooked through, about 25 minutes. The juice should run clear when the thickest part of the thigh is pierced with a skewer. 5. 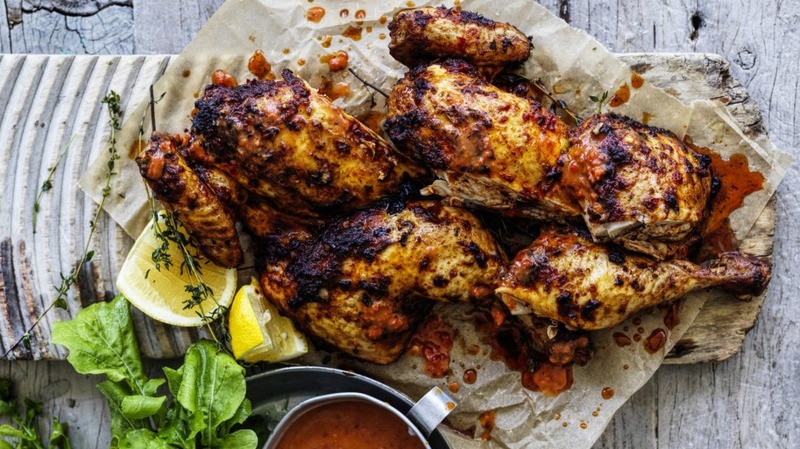 Remove chicken from the oven, and allow to rest before carving and serving with extra piri-piri oil and lemon wedges.